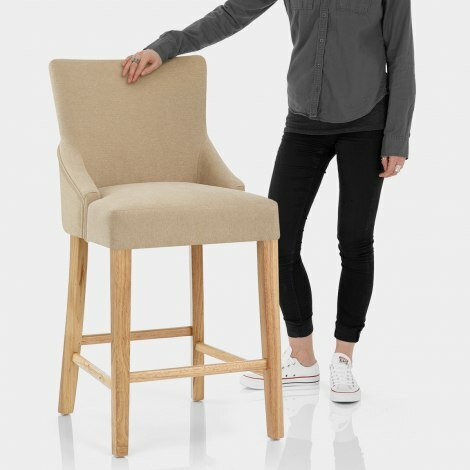 Enhance the stylish qualities of your bar area with the Magna Oak and Beige Fabric Bar Stool. Sure to have an impact on any room it is placed in, the Magna's fashionable appeal is unquestionable. Projecting pure sophistication, the seat is densely padded and is sprung and belted for optimum comfort. It also features a high backrest and wraparound design for additional support. Upholstered in a versatile, beige fabric, it employs the characteristics of a dining chair, yet is positioned at fixed, kitchen height to give a chic touch that will draw attention from all directions. 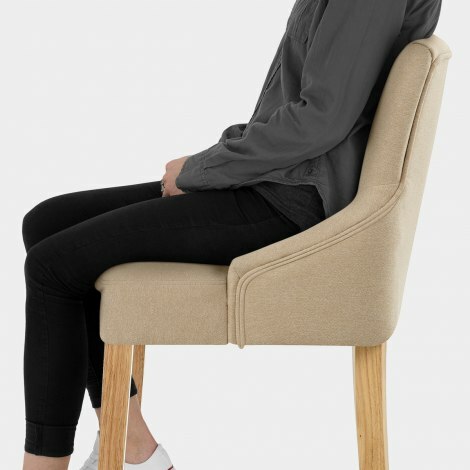 Supported by a solid wooden frame with an oak finish, the legs are connected by strengthening bracing bars that also act as a front footrest for stability. "The quality of these bar stools is second to none"
This is the second time we have ordered this item. As last time it arrived on time next day delivery. I cannot fault this company and their product. We have recently purchased a Magna oak bar stool to go with the two we purchased two years ago. The quality of these bar stools is second to none, the original stools still look brand new despite being used constantly. They are so comfortable yet sturdy. We also purchased dining chairs two years ago and these also still look brand new. I cannot recommend these products highly enough, plus the customer service from this company is amazing whether you purchase in store or online together with free next day delivery! Just brilliant! Fast delivery - love the stools - researched on the internet before buying so glad I did - they are perfect - Thank you. Comfortable, excellent price, and look good. Purchased 3 of these bar stools for my new kitchen and I was not disappointed. Great quality and very comfortable.